Imagine living in the perfect community: In this paradise, each home is beautifully crafted with impeccable design, and equipped with high-end appliances and finishes that can be customized to your liking; it’s located in a highly acclaimed school district; it has plenty of elbow room, located on a lot measuring more than an acre; and it’s in an ideal location, only minutes away from Philadelphia, Wilmington, Del., and from the business districts of South Jersey like Cherry Hill and Marlton. You don’t have to imagine anymore, because this community exists. It’s called Chestnut Ridge, a community of 36 luxury single-family homes, just across the bridge in beautiful Woolwich Township. Chestnut Ridge by Fernmoor Homes is a family-owned company located in Jackson, N.J., known for building innovative homes throughout New Jersey and Delaware. For over 25 years, homeowners have come to expect expertise, professionalism and attention to detail from Fernmoor’s team of professionals who are committed to exceeding each client’s expectations. In addition, Fernmoor Homes and its affiliated partners have been recognized for excellence by the Shore Builders Association of Central NJ, the New Jersey Builders Association, the Home Builders Association of Delaware and the National Association of Home Builders. 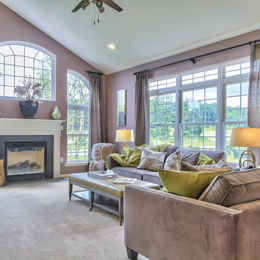 Chestnut Ridge offers four types of homes: Cypress, Elm, Hickory and Juniper. Prices range from $387,990 to $418,990, with Cypress at one end of the scale and Juniper at the other. The homes range from 2,682 to 3,357 square feet plus, with each one including four bedrooms, two and a half bathrooms, an open floor plan and a two-car garage. Each floor plan can be expanded with one of their many structural options. At Chestnut Ridge, options abound. Fernmoor can add rooms such as an inlaw suite, sunroom and a conservatory, and they can finish the basement and build a custom deck if the buyer desires. Chestnut Ridge also has a design center on site with a décor manager who can help buyers select all of their interior finishing selection. Bachrach lives just five minutes from Chestnut Ridge and her son is a student in the Kingsway Regional School District, so she can attest to the area’s desirability. Woolwich Township is minutes from I- 295 and the New Jersey Turnpike, with access to Central and North Jersey, as well as Philadelphia and Delaware. In other words, it offers convenient access for easy travel. Rowan University and the new Inspira Medical Center in Mullica Hill, N.J.—a $349 million project currently under construction— are both just 10 minutes away as well. In addition, there are many convenient shopping options just 20-30 minutes away, including the Cherry Hill and Deptford malls, and the Christiana Mall in Delaware which has tax-free shopping. While Bachrach was born and raised in Philadelphia, she has lived in Gloucester County for 20 years and couldn’t be more proud to call it home. Her knowledge of the South Jersey real estate market—specifically Woolwich Township—made her the ideal sales manager to sell homes in Fernmoor Homes’ Chestnut Ridge community. She considers herself an important resource for those who may be unfamiliar with the area, offering important insights as to commuting times to Philadelphia, major business hubs, and local shopping and recreation. Outstanding value isn’t an option at Fernmoor Homes. It is built into every home for today and tomorrow. Tours of the community are available Sunday through Thursday, from 10 a.m. to 5 p.m. or by appointment. To set up a tour and inquire about purchasing a home in the Chestnut Ridge community, call Michelle Bachrach at (856) 624-9100. 15 Oak View Terrace | Woolwich, N.J.